At the invitation of President Ibrahim Boubacar Keita of the Republic of Mali, Vice Chairman of the National Committee of the Chinese People's Political Consultative Conference Zheng Jianbang, as President Xi Jinping's Special Envoy, will travel to Bamako, the capital of Mali, to attend the inauguration ceremony of President Keita on September 22. China and Mali enjoy profound traditional friendship. During the past 58 years since the establishment of diplomatic relations, our bilateral ties have been growing smoothly with notable outcomes in cooperation across the board. China remains a sincere friend and reliable partner of Mali. The destiny of the Chinese people is closely connected with that of the people in Mali. China attaches high importance to the development of its ties with Mali. We are willing to work with Mali to take the implementation of the outcomes of the 2018 Beijing Summit of the Forum on China-Africa Cooperation as an opportunity to elevate our traditional friendly cooperative relations and deliver greater benefits to our two countries and two peoples. Q: On September 19, the European Commission issued a policy document titled "the EU strategy on connecting Europe and Asia", which represents the most comprehensive and systematic policies and proposals put forth by the EU on the Eurasian connectivity so far. The paper said that China would be a priority for bilateral cooperation and highlighted the China-EU cooperation on the connectivity platform as well as the cooperation between the EU and the Asian Infrastructure Investment Bank. What is your comment? A: We have noted that the EU issued the policy document on the Eurasian connectivity yesterday. The document speaks highly of the significance of the Eurasian connectivity and its role in driving the Eurasian economic growth, advocates the "comprehensive, sustainable and rules-based connectivity" and expresses the EU's willingness to strengthen cooperation with China and other Asian countries. We hope that the EU can play a constructive role in advancing the Eurasian connectivity and send out the positive signal of promoting the economic cooperation between the Eurasian countries and building an open world economy. Strengthening the connectivity of the Eurasian continent will help open up new room for the economic growth of the region as well as the world and inject new impetus into the cooperation between the Eurasian countries. It serves the common interests of all relevant parties. The Chinese side always actively supports the Eurasian connectivity, which is also an important goal of the Belt and Road Initiative. The leaders of China and the EU have reached consensus on seeking synergy between the Belt and Road Initiative and the EU's connectivity plan. Our two sides have also established the China-EU connectivity platform. 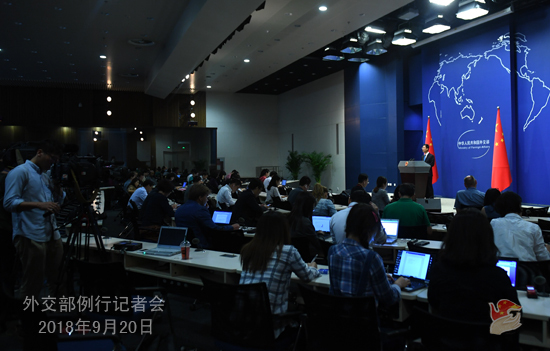 We believe that with the concerted efforts of China and the EU, the China-EU connectivity will continuously make new progress and deliver benefits to the people of all countries in the region. Q: Several Chinese Uygurs living abroad say they haven't been able to contact their relatives for over a year. They fear that their family members in China may have been "segregated". Can you tell us what happened? A: You may have missed our press conferences in recent weeks, and I already took similar questions. I'm not aware of the case you mentioned. But we noted that there has been much interest in Xinjiang recently, and I could say a few words about that. The series of measures implemented in Xinjiang are meant to improve stability, development, solidarity and people's livelihood, crack down on ethnic separatist activities and violent and terrorist crimes, safeguard national security, and protect people's life and property. Xinjiang enjoys social stability, sound economic growth and harmonious coexistence of ethnic groups. People there enjoy full freedom of religious belief. I would like to share with you some statistics here. In 2017, the number of visitors travelling to Xinjiang from at home and abroad topped 100 million, increasing by 32.4% compared to the previous year. From January to July this year, the number hit 78.33 million, rising by 38.7%. If Xinjiang were unsafe, unstable and inharmonious, there wouldn't have been so many Chinese and foreign visitors going there. I believe this in part proves the sound situation in Xinjiang. Q: Japanese Prime Minister Shinzo Abe was reelected President of the Liberal Democratic Party (LDP). What is China's expectation? A: We have noted Japanese Prime Minister Shinzo Abe's reelection as the president of the Liberal Democratic Party (LDP). We hope Prime Minister Shinzo Abe will continue to attach importance to China-Japan relations and move forward the continuous improvement and development of our bilateral relations. Q: Yesterday the DPRK and ROK leaders held a meeting and inked the Pyongyang Joint Declaration of September. The US sent its congratulations on that. President Trump said he will be meeting Chairman Kim Jong Un soon. Secretary of State Mike Pompeo said in a statement that the United States is prepared to engage immediately in negotiations to transform US-DPRK relations. What's your comment? A: Just as State Councilor and Foreign Minister Wang Yi said, we express warm congratulations on and lend staunch support to the meeting of the DPRK and ROK leaders once again and the signing of the Pyongyang Joint Declaration of September. We noted that the US speaks positively of this inter-Korean summit and makes positive remarks on talks between the DPRK and the US. 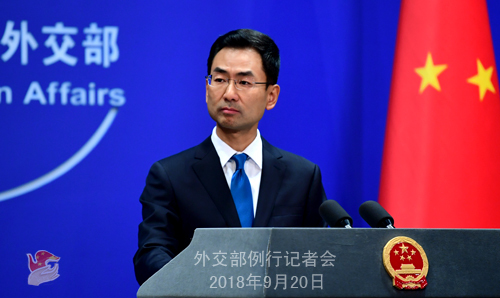 The Chinese side supports and looks forward to the efforts by the DPRK and the US to step up contact and negotiations, accommodate each other's legitimate concern, enhance mutual trust, implement the consensus reached at the DPRK-US summit and make new progress in the denuclearization of the Peninsula and the political settlement process. Q: According to the Pyongyang Joint Declaration of September, the DPRK decided that it would first permanently close the missile launch pad and the engine testing site in Tongchang-ri in the presence of experts from relevant countries. If the US took reciprocal steps according to the spirit of the joint statement it signed with the DPRK on June 12, the DPRK was ready to take such additional measures as permanently disassembling its nuclear facilities in Yongbyon. What is your comment? 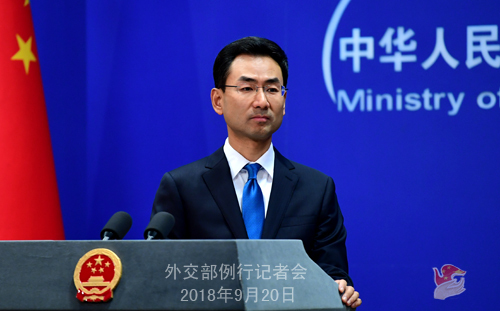 A: The DPRK reaffirmed its will for denuclearization and made statements on taking further steps in this regard during the DPRK-ROK summit in Pyongyang, which deserves full recognition. We hope that the DPRK and the US can meet each other halfway and make earnest efforts to achieve the denuclearization and lasting peace of the Korean Peninsula. All relevant parties should also make joint efforts towards this goal. Q: Prime Minister Shinzo Abe announced today that he would continue to work on the revision of the Constitution. What's your comment? A: We already stated our position clearly on the issue of Japan's revision of the Constitution many times. Due to what happened in history, the issue of Japan's revision of the pacifist Constitution has been followed by the international community. We hope that the Japanese side will draw lessons from history, honor the commitment it has made, adhere to the path of peaceful development and take concrete actions to win the trust of its Asian neighbors and the international community.